Do your kids love pretending to be superheroes too? Both my daughter and my son love pretending to be a variety of masked comic book heroes. Right now, Wonder Woman is having a moment and I couldn't be more thrilled. 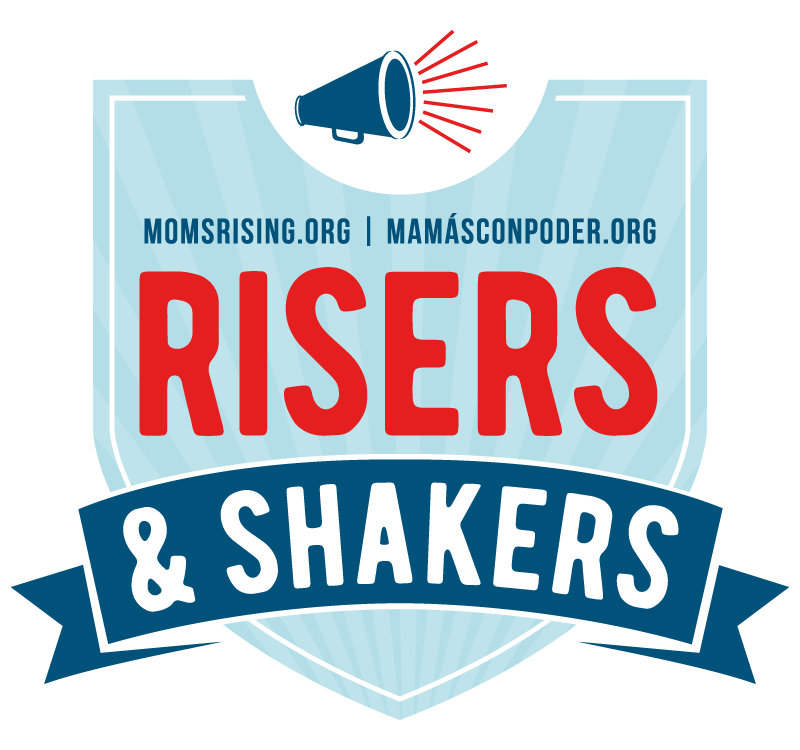 My daughter already loved Wonder Woman, but after we went to see the new Wonder Woman movie – let me tell you… THIS is the kind of strong female character I wish I grew up knowing. According to Bustle's article “Why Women are Crying During ‘Wonder Woman' Fight Scenes,” I am not alone in these feelings. Wonder Woman's character, Diana Prince, is confident in her abilities and strong. She grew up not knowing anything different and that is how I want my daughter to grow up. 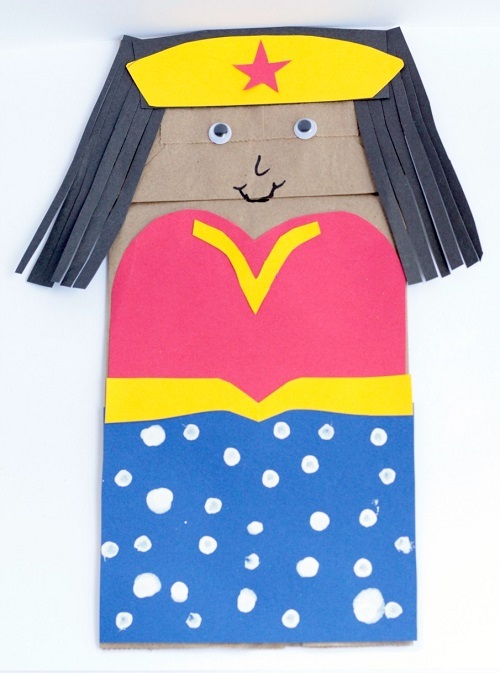 Now, help your kids celebrate this strong woman by making this fun Wonder Woman paper bag puppet craft! Saving the world has never been so fun! This post contains affiliate links. We may earn a commission on purchases made. 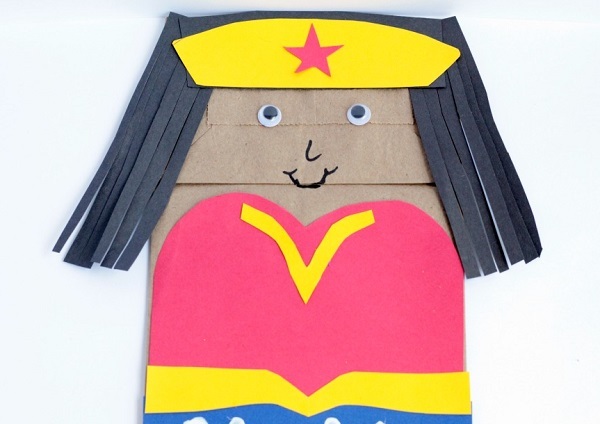 This fun paper bag puppet is easy to make, and kids will love playing with their very own Wonder Woman. She flies, she saves the day, it's all around fun! After you are done with this project, keep the fun going with our Unicorn Paper Bag Craft tutorial. Paper bag (brown or white) You can find a pack of paper bags at your local store or get paper bags on Amazon. Measure the width of the paper bag (ours was about 5 inches across). 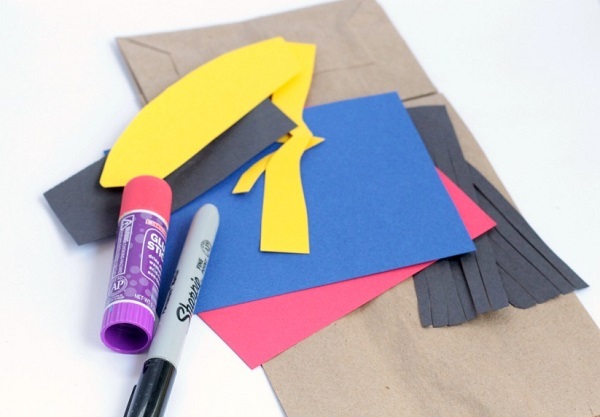 Use the width of the paper bag as a guide for how wide to make your paper clothing strips. Use the following image as a guide for what shapes to cut out of the paper. You'll need a red bodice, blue pants, a yellow belt and crown, a yellow bodice edging piece (you could also make this into a W if you wanted) and a red star. For hair, you'll need some black paper. To make the hair, we cut two rectangles of black paper into strips (but not quite all the way to the end to keep them together). 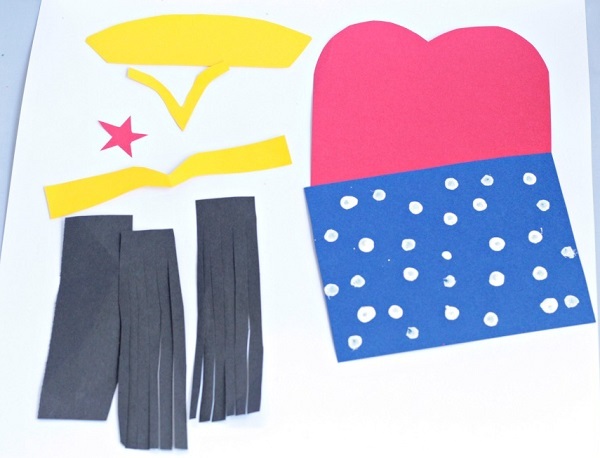 Give Wonder Woman her “star” pants by dipping a cotton swab into white paint and adding white dots to the blue paper. Kids will love this part. Let the paint dry. Glue all of Wonder Woman's clothing to her body. Glue on the hair and crown. Finally, draw a face onto the paper bag with a marker. Make sure the mouth slightly overlaps the fold in the paper bag so that it looks like the mouth is opening when you put your hand in the paper bag. Glue on the googly eyes and Wonder Woman is ready to save the day! Alternatively, you can use markers, colored pencils, or crayons to give Wonder Woman her clothes, but the colors won't be as bright. You could also use black yarn to give her textured hair. Kids love pretending to be superheroes and saving the world. 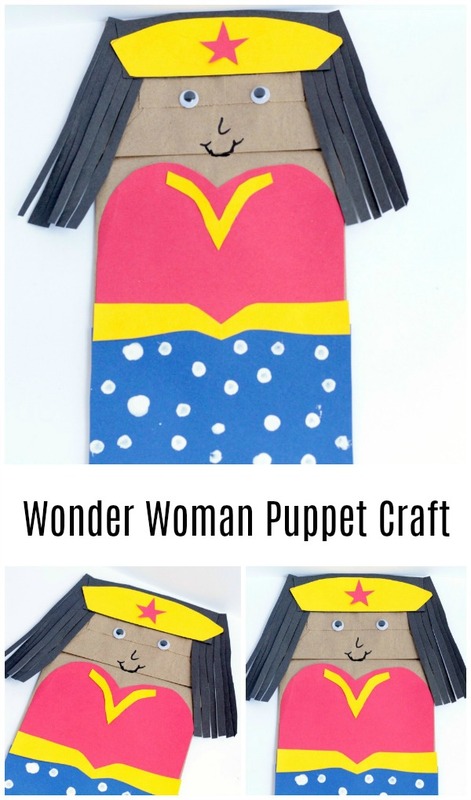 Let them get creative and use their imagination to put on a fun puppet show or engage in pretend play with this Wonder Woman paper bag puppet craft for kids.